How to Cite This Chapter: Lysecki P, Kahnamoui K, Ciećkiewicz J. Adynamic Ileus. McMaster Textbook of Internal Medicine. Kraków: Medycyna Praktyczna. https://empendium.com/mcmtextbook/chapter/B31.II.4.25.1 Accessed April 20, 2019.
d) Biliary and pancreatic diseases. e) Other types of gastrointestinal (GI) perforation (colonic perforation, abdominal penetrating injury, inflammatory bowel disease). 2) Renal colic accompanying kidney stones or urinary tract infection. 4) Metabolic disturbances (ketoacidosis in patients with diabetes mellitus or ethanol poisoning, uremia, hypokalemia or hyperkalemia, rarely porphyria). 5) Retroperitoneal or intraperitoneal hematoma (eg, rupture of an aortic aneurysm or the spleen, vertebral fracture). 6) Intestinal ischemia, either acute or chronic. Acute intestinal ischemia can be subcategorized as embolic (eg, atrial fibrillation), thrombotic (due to plaque rupture), venous, or nonocclusive (low-flow). Chronic ischemia refers to progression of atherosclerosis of the abdominal arteries. 8) Diseases of the organs located in the chest: Myocardial infarction, lower lobar pneumonia. 1. Symptoms: The characteristic triad of symptoms of GI obstruction includes abdominal pain, nausea and vomiting, and retention of gas and stools. It is important to qualify the pain as localized or generalized, constant versus intermittent, and dull/crampy versus sharp, as this may help define the underlying cause and determine whether urgent surgical therapy is necessary (Figure 1). 2) Absent peristaltic sounds (silent abdomen). 4) Signs of peritonitis (if this is the cause): Abdominal guarding (increased abdominal muscular tone, which intensifies on slight pressure), pain when attempting to cough, rebound tenderness (pain upon removal of pressure greater than upon application of pressure), and frequently fever. A prompt confirmation of the diagnosis of peritonitis is of crucial importance because a delay in surgical intervention may lead to the development of inflammation, infection (systemic inflammatory response syndrome, sepsis [see Sepsis and Septic Shock]), and to life-threatening multiple organ failure. The cause of the disease may be suggested by a characteristic history or a typical pattern of pain. Consideration must be given to the various causes of mechanical GI obstruction and ileus in forming a differential diagnosis. 1. Complete blood count: In patients with peritonitis, an increase in white blood cell counts and neutrophil counts is usually observed. With time, this may be accompanied by increases in hematocrit and hemoglobin due to progressive dehydration. 2. Blood biochemical tests: Pancreatic enzyme levels, glucose levels, liver function tests, coagulation tests, lactate levels, and renal function parameters are important for identifying the underlying cause and potential complications. 1) Plain abdominal radiographs are useful in demonstrating the presence of an ileus. Films taken in the upright position (standing or sitting in acutely ill patients) or when lying on the side (the most sensitive view) may demonstrate free intraperitoneal air, which is evidence of GI perforation (Figure 2). Other radiologic features are less characteristic. 2) Abdominal ultrasonography is not the test of choice to demonstrate ileus but may reveal a causative process, such as ascites, cholelithiasis, or kidney stones, as well as abnormalities of the gallbladder and pancreas. 3) Abdominal and pelvic computed tomography (CT) provides more detailed information on the causes of adynamic ileus, but may be omitted if previous imaging and signs or symptoms clearly point to the cause (eg, perforation) and treatment will not otherwise be altered. 4. Laparoscopy or laparotomy is sometimes performed in situations of diagnostic uncertainty. Patients should be almost always referred for surgical consultation. Medical treatment is used in patients with metabolic conditions and in some patients with ileus as a result of renal colic (analgesics), acute pancreatitis, or bowel ischemia. Supportive management includes vigilant management of fluid and electrolyte status, minimization of opioid use, and patient mobilization as appropriate. Nasogastric decompression, advised as universal by some surgeons, should be at least considered on a case-by-case basis and may benefit the patient who is symptomatic with nausea or vomiting and distention. The balance between benefits and potential harms (violating the upper and lower esophageal sphincters with possibly increased risk of aspiration) in individual patients may not be clear. In other patients with acute intra-abdominal conditions leading to impaired intestinal motility, laparotomy or laparoscopy with an appropriate surgical procedure is usually performed. Any associated hypovolemia or shock should be aggressively managed while awaiting surgery. Figure 1. The character of pain and abdominal guarding in certain conditions associated with adynamic ileus: A, perforation of a peptic ulcer; B, biliary colic; C, acute cholecystitis; D, acute pancreatitis; E, appendicitis; F, adnexitis; G, perforation of a sigmoid diverticulum; H, renal colic. Figure 2. 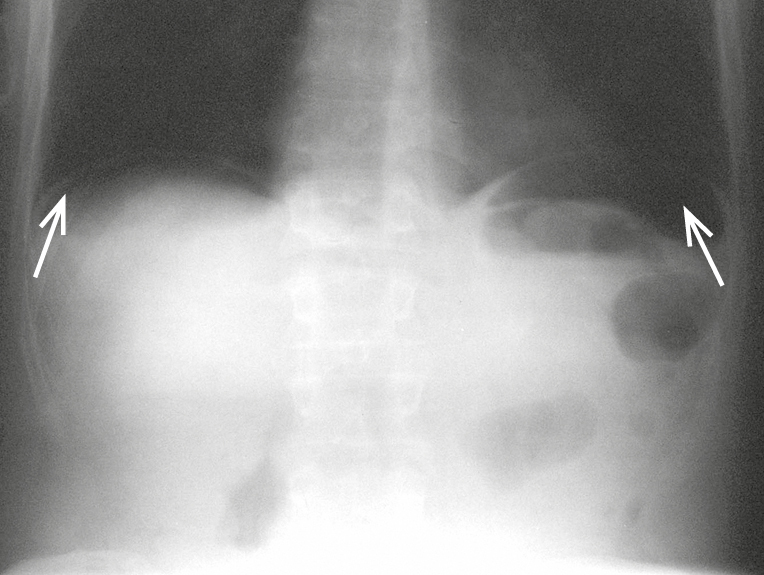 Plain abdominal radiograph in the standing position including the diaphragm. Perforation of the gastric ulcer with visible free gas (arrows) under both hemidiaphragms.